VANCOUVER, BC--(Marketwired - October 21, 2016) - Turquoise Hill Resources today filed an updated compliant independently-prepared technical report under National Instrument 43-101 -- Standards of Disclosure for Mineral Projects ("NI 43-101") relating to the Oyu Tolgoi Project (the "Project"). Prepared by OreWin Pty Ltd, the 2016 Oyu Tolgoi Technical Report (2016 OTTR), updates the Oyu Tolgoi Technical Report dated September 20, 2014 (2014 OTTR). On May 5, 2016, Turquoise Hill announced that the 2016 Oyu Tolgoi Feasibility Study (OTFS16) had been finalized and presented to the Board of Directors of Oyu Tolgoi LLC. The 2016 OTTR updates the 2014 Reserve Case based on OTFS16 to the 2016 Reserves Case and includes four Preliminary Economic Assessments with regard to the Oyu Tolgoi resources. · Reserves and resources have only changed to the extent of mining depletion from open-pit operations. · Assumes a January 1, 2017 start date for production schedules and accommodates for the delayed mid-2016 underground project restart. · Assumes processing of 1.4 billion tonnes of ore, mined from the Oyut open pit and the first lift in the Hugo North underground block cave. · Plant capacity remains at an average production rate of 40 million tonnes per annum (Mt/a). · Underground mine remains at targeted full production rate of 95,000 tonnes per day. · Updates to expansion capital and Net Present Value (NPV) range analysis. October 23 (MarketBeat.com) Turquoise Hill Resources Ltd. (NYSE:TRQ)'s stock had its "sector perform" rating reiterated by Scotiabank in a report issued on Sunday. They currently have a $5.50 price target on the stock. Scotiabank's price objective would indicate a potential upside of 77.42% from the stock's previous close. A number of other equities analysts have also recently weighed in on TRQ. Royal Bank Of Canada initiated coverage on Turquoise Hill Resources in a report on Monday, July 18th. They issued a "sector perform" rating and a $4.00 price target for the company. RBC Capital Markets reissued a "sector perform" rating and issued a $5.00 price target on shares of Turquoise Hill Resources in a report on Tuesday, July 19th. TD Securities reissued a "buy" rating and issued a $5.50 price target on shares of Turquoise Hill Resources in a report on Thursday, August 4th. Finally, Canaccord Genuity initiated coverage on Turquoise Hill Resources in a report on Wednesday, August 17th. They issued a "hold" rating and a $4.50 price target for the company. Seven analysts have rated the stock with a hold rating and two have assigned a buy rating to the company. The stock presently has an average rating of "Hold" and a consensus price target of $4.64. Ulaanbaatar, Mongolia, 21 October 2016 (Oyu Tolgoi LLC) Oyu Tolgoi today announced an update on its production for the third quarter of 2016. Oyu Tolgoi continued to deliver solid safety performance over the past quarter, achieving record material mined over the quarter crossing 25 million tonnes and delivering continuing progress with underground development - including award of critical contracts. Safety continues to be a major focus throughout Oyu Tolgoi's operations and the mine's management is committed to reducing risk and injury. Oyu Tolgoi achieved an excellent safety performance with an All Injury Frequency Rate of 0.15 per 200,000 hours worked for the nine months ended September 30, 2016. Oyu Tolgoi set an all-time high in Q3'16 for quarterly material movement of more than 25 million tonnes. This record includes stripping for Phase 4, which is the next area of high-grade ore. In Q3'16, concentrator throughput declined 4.0 per cent over Q2'16 due to planned maintenance and conveyor belt repairs. Copper production in Q3'16 declined 9.9 per cent over Q2'16, as a result of lower recovery from Phase 6 ore. As expected, gold production in Q3'16 declined 47.1 per cent over Q2'16 due to lower grades from the completion of mining Phase 2. Turquoise Hill Resources continues to expect Oyu Tolgoi to produce 175,000 to 195,000 tonnes of copper in concentrates and 255,000 to 285,000 ounces of gold in concentrates for 2016. Xanadu Mines Ltd (ASX:XAM) is focussed on copper and gold in Mongolia's highly mineralised south Gobi region. October 24 (Proactive Investors) Xanadu has now appointed Dr Andrew Stewart as managing director and chief executive officer. Mark Wheatley, executive chairman, will move to non-executive chairman. Both changes are effective immediately, and are in line with the company's succession plan. Stewart commented: "Over the next few months, I will be appointing a highly experienced chief geologist to ensure a seamless transition of the succession plan. "This will complete a reorganisation of our exploration team in Mongolia to ensure our focus on exploration success continues and will strengthen in-country capacity to support our well-funded ongoing exploration programs across multiple projects. "My move to Australia will assist with promotion of the company and provide easier and more regular access to important stakeholders and capital investment markets." 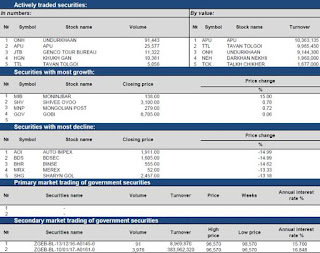 October 21 (Bank of Mongolia) Buy order of 28 weeks Government bonds with annual interest of 16.897%, and 39 weeks Government bonds with annual interest of 16.990% starts from 21 October 2016 until 25 October 2016 through brokerage companies. 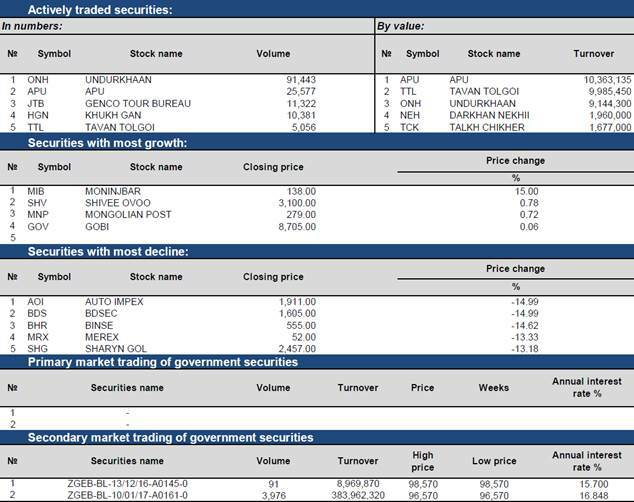 Click here to see detailed information of 28 weeks Government bonds. Click here to see detailed information of 39 weeks Government bonds. LONDON, Oct 21 (Reuters) - Copper edged lower on Friday to mark the metal's third weekly fall, partly in response to the dollar, which hit an 8-month high, and also worries about China's demand, while zinc, lead and tin posted weekly gains. London Metal Exchange copper closed down 0.4 percent at $4,635 a tonne, not far off its lowest in a month reached last week, on concerns over the impact of steps by China to douse its hot housing market, which drives demand for copper to produce white goods and power. "There will probably be weaker imports of copper into China going forward due to the restrictions on the real estate sector," Commerzbank analyst Eugen Weinberg said. "The strength of the U.S. dollar and its impact on commodity prices should not be underestimated ... and I would not be surprised to see that weakness in copper continuing." Average new home prices in China's 70 major cities rose 11.2 percent in September from a year earlier. There were some glimmers of hope for a pick up in demand during the seasonally stronger fourth quarter from higher China copper premiums, which rose by $5 to $70 a tonne, the highest since March. Premiums for refined zinc in China bonded zones also rose by $5 to $120 a tonne, the highest since May. Traders said they were holding onto stock in hopes of higher premiums, ahead of fourth quarter restocking by galvanisers and given dwindling mine supply. Three-month zinc prices on the LME did not trade at close but were bid down 1.1 percent at $2,261 a tonne. They were up around 0.5 percent on the week. The metal has gained 41 percent this year so far, on reduced supply. Standard Chartered more than doubled its 2016 forecast zinc deficit to 464,000 tonnes, driven by a shortfall of mine supply within China. LME aluminium climbed away from one-month lows, closing up 0.8 percent at $1,625 a tonne, but fell 2.9 percent on the week, its biggest weekly drop since early September, as China producers ramped up supply. Daily average primary aluminium output hit a record in September, driven by buoyant output in top producer China, while exports of semi-finished products hit their highest since last November, undermining global prices. Also supporting prices more widely was the threat of new pollution-related closures in China that had forced shorts to cover. LME lead gave up earlier gains that took it to a one-week high of $2,030. 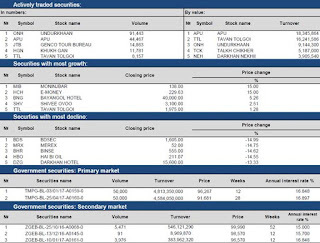 It closed down 0.8 percent at $1,998, while tin, which did not trade at close, was bid up 0.5 percent at $19,925 a tonne and posted a 2.6 percent weekly gain. Nickel closed down 1.7 percent at $9,960 a tonne, its lowest level for two weeks. October 21 (Reuters) While no steel maker will be happy with the explosion in coking coal prices, Chinese mills are the best placed to deal with the impact, given they are nowhere near as exposed to spot prices as competitors in the rest of Asia and Europe. The spot price of premium hard coking coal in Australia, which dominates global exports, surged to $242.90 a tonne on Oct. 20, taking the rally so far this year to a staggering 210 percent. While only a small percentage of coking coal cargoes are actually sold at the spot price, the quarterly contract price was recently settled above $200 a tonne and customers of Australia's BHP-Mitsubishi Alliance, the world's largest coking coal exporter, will be paying prices linked to monthly indexes. Given that about 770 kg of coking coal is required to make one tonne of steel, the more than tripling of prices since this year's rally took off in July will be causing pain for steelmakers, who have not enjoyed nearly as large gains in their products. However, given Chinese steel makers are far less reliant of seaborne imports than those in Japan, South Korea and Britain for example, their competitive advantage has been increasing. 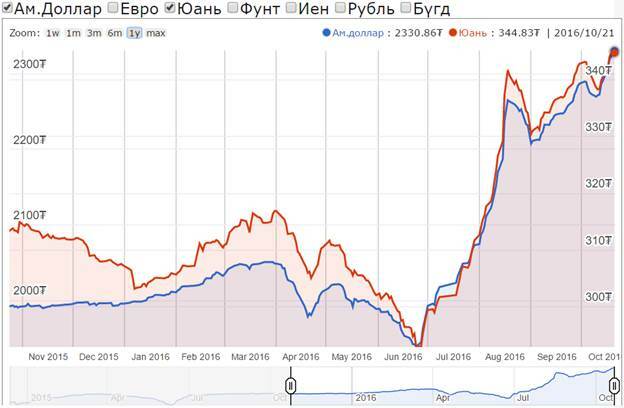 While domestic Chinese coking coal prices have been rising, they are still well below the seaborne equivalents. Coking coal futures on the Dalian Commodity Exchange closed on Friday at 1,235 yuan ($182.69) a tonne. They are up about 119 percent so far this year, a substantial jump, but only slightly more than half what Australian spot coking coal prices have risen. Chinese coking coal output rose 7.3 percent to 39.29 million tonnes in September from a year earlier, taking production for the first nine months of the year to 331.74 million tonnes, down 1.6 percent from the same period in 2015, the National Bureau of Statistics said on Oct. 19. There are two main points to note from this data, firstly that coking coal has largely been spared from the cuts in domestic output that has seen China's total coal output slump 10.5 percent in the first three quarters, and secondly, domestic production accounts for the major slice of China's consumption. Coking coal imports were 37.9 million tonnes in the first eight months of the year, according to customs data. This means that it took eight months for imports to reach roughly the same level as one month's domestic output. While Australia is China's biggest supplier, meeting almost half of import demand, the second biggest source is Mongolia. This gives Chinese steelmakers a further advantage as coking coal sourced from Mongolia is far less expensive than cargoes from the seaborne market, given Mongolia's mines have effectively only one buyer for their output, thereby cutting their pricing power. Mongolia supplied 12.78 million tonnes of coking coal to China in the first eight months of the year, a jump of 51.7 percent from the same period in 2015. In contrast, imports from Australia were 18.75 million tonnes, a gain of 8.5 percent, numbers that clearly indicate a mounting preference by Chinese steel mills for cheaper Mongolian cargoes. 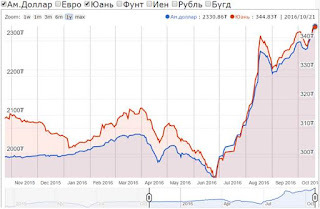 Customs data for August showed a price of $93.92 a tonne for Australian coking coal and just $34.20 for shipments from landlocked neighbor Mongolia. The numbers for September will be released next week and are likely to show rising prices, but it's extremely unlikely that Mongolian cargoes will have jumped more in percentage terms than those from Australia, thus widening the gap between the two. Overall, it seems very likely that Chinese steelmakers are now enjoying a coking coal cost advantage not available to their competitors, especially those located in the northeast, close to both domestic and Mongolian mines. China's benchmark steel rebar contract is up about 46 percent so far this year, a strong gain, but probably one that has been more than offset by the surge in coking coal, and iron ore, where spot prices have gained 36 percent so far this year. But while Chinese steel mills are probably seeing their profits being crimped, they won't be suffering to the same extent as many of their global competitors. This means that cheaper Chinese steel product exports are likely to continue to force their way into global markets, which may promote further calls for protectionist measures from the losers. It also underscores that given the limited ability of coking coal exporters to quickly ramp up production, any downward move in the price is likely to come from declining steel production cutting demand for the fuel. October 21 (UB Post) Voting for Citizen's Representative Council Elections (CRCE) took place from 7 a.m. to 10 p.m. on October 19, throughout Mongolia. A number of seats on councils remained empty after ballots were counted, as several candidates were not able to reach the required 50 percent of the vote from the electorate and candidates in many soums tied with their opposition. On October 20, Head of the Mongolian General Election Commission (MGEC) Ch.Sodnomtseren held a briefing about the elections but did not give an official statement about any election results impacted by low voter turnout. He did speak about laws and regulations concerning publicizing the results of the CRCE. He said that procedures to announce the results of these elections are different from parliamentary and president elections, and that there were too many candidates for this election, so tabulating the results of the election will take time. He noted that according to the Law on Elections, the election commissions of soums and districts must present their Citizen's Representative Councils with official election results within five days of the elections, and Citizen's Representative Councils must make election results public within seven days of their submission by election commissions. According to unofficial reports, Mongolian People's Party (MPP) candidates won a majority of seats in over 200 soums, out of over 330 soums, and Democratic Party (DP) candidates won the most votes in the remaining soums. Both parties saw narrow victories for seats in the six districts of Ulaanbaatar which reached 50 percent voter turnout. Voters who did not participate in the October 19 elections are being encouraged to go to the polls on Sunday to vote for candidates to fill 57 Citizen's Representative Council seats in soums and 78 seats in Ulaanbaatar, in an effort to reach 50 percent participation. Sunday's votes will be added to the results collected from Wednesday's ballots. Ulaanbaatar's Nalaikh, Bagakhangai, and Baganuur district elections saw 50 percent voter turnout, with the exception of voting for one seat in Baganuur. MPP candidates won the most seats in these districts. New elections will also take place for 57 seats in 19 provinces on October 29 for elections that resulted in tied votes. All eligible voters are encouraged to go to polling stations for these elections, where new ballot papers will be provided for the 57 empty seats. Dashdulam, a polling place worker in the 4th khoroo of Bayanzurkh district, said, "Where are the people? Why did they not come out to vote? Today is a day off for this election throughout Mongolia. People are responsible for voting in this election, because a lot of money was budgeted for the election and many officials and observers spent their time on it, but voters didn't carry out their responsibilities." Tumurkhuleg, a voter interviewed at a polling place, said, "People care about the parliamentary elections, but in reality, the Citizen's Representative Council Elections are very important to the public, because the representatives are closer to the people and speaking for the challenges facing us, listening to their opinions, and meeting them face to face. Members of Parliament are very far from us, because their responsibility is to pass laws. Unfortunately, people's perceptions are different from reality. They need to come here to vote." October 21 (news.mn) On 19th of October, Mongolians voted for the election of the people's representatives to the 'soum khurals' (district councils) and municipal councils. According to the preliminary results, the Mongolian People's Party (MPP) has won in more than 200 soums of 21 provinces, however, the Democratic Party (DP) has taken seats in over 100 soums. A total of 15,185 candidates from 330 soums in the country's 21 provinces and from the nine districts of Ulaanbaatar registered to compete for 7299 seats; 710 were independent candidates and 4530 were women. A total of 2.6 million Mongolians were registered to vote in the local election, however turnout was very poor. More than 20 thousand staff were involved in the election which cost MNT13.9billion. In June's general election, the MPP won a landslide victory, taking 65 out of 76 seats in the State Great Khural (parliament). October 21 (Bloomberg) -- Sources for generating revenue for Mongolia's 2017 budget include privatization of state-owned enterprises, including State Bank and the Mongolian Stock Exchange, Bulgantuya Khurelbaatar, Deputy Minister of Finance, said in Ulaanbaatar. * Bulgantuya spoke at a meeting hosted by the American Chamber of Commerce in Mongolia. Ulaanbaatar, October 21 (MONTSAME) Under a decision of the Board of Directors of the Erdenes Mongol LLC, O.Odbayar has been appointed the deputy director of the company. He will be in charge of the business development affairs of Erdenes Mongol. Previously, O.Odbayar worked as the vice president of the Altai Holding, chairman of the Board of Directors of UB Cinema LLC, member of Board of Ard Insurance LLC, adviser to the Prime Minister between 2010 and 2012, and as the third secretary at the Embassy of Mongolia in Beijing between 2005 and 2010. He graduated from the National Pedagogical University of Kiev in 1988, the Florida Institute of Technology in 1997 and Otgontenger University in 2000. October 21 (gogo.mn) Total operational expenditure of Ministry of Road and Transport is set at MNT 9 billion 540.3 million in 2017. Of which 701.2 million will be funded from projects, which will be implemented by the foreign loan and aid. The Government of Mongolia will finance the remaining operational expenditure of MNT 8 billion 839.1 million. Total operational expenditure of Ministry of Road and Transport decreased by 3 percent or MNT 325.6 million compared to the 2016 budget. In 2017, the Government has planned to move major rail projects that are stuck. In regards, railways to connect Tavantolgoi to Gashuunsuhait is expected to be commissioned by the end of 2018. The construction will start to continue from April, 2017. Currently, 51 percent of the Tavatolgoi-Gashuunsuhait railway has completed and it has stuck due to financial issue. In 2012, ICOM Australia started the railway construction in 2012 on the 1520 mm gauge. However, Government of Mongolia discussed the measurement between two rail lines and decided to construct this railway on the 1435 mm gauge. October 23 (UB Post) The following is an interview with newly appointed executive director of state-owned Mongolian Railway Company Kh.Kherlen about ongoing projects and future plans of the company. Congratulations on being promoted to Mongolian Railway's executive director. Can you tell us how you got to this position? I'm a lawyer with a master's degree in technical sciences. As for work experience, I spent the last 10 years working for government agencies, including the State Construction Design Institute, Mineral Resources Authority, Ministry of Industry and Trade, and State Property Committee. I started working as the executive director of Mongolian Railway on October 7. It's been 100 days since the new government was established. What has Mongolian Railway accomplished during this period? What kind of major projects have been planned? Our company is a state-owned company engaged in railway transportation and construction of basic railway structure. We opened a 33.4-kilometer railway from an iron ore mine located in Khuder soum to Yuruu soum in Selenge Province in May. Currently, over 600,000 tons of iron ore have been transported. Our target is to transport a million tons more before the end of the year. We transport with our own wagons and locomotives, which greatly contributes in improving usage of rolling stocks, learning to use modern technology, and enhancing freight transport in Mongolia. We studied and submitted a proposal to the Ministry of Roads and Transportation to add Zuunbayan-Khangi railway track in the State Policy on Railway Transportation, approved by Parliament in 2010, to start constructing a railway in this route, as specified in the government action plan through 2030. We also submitted a feasibility study for connecting Tavan Tolgoi-Gashuunsukhait railway with Oyu Tolgoi deposit's railway station and a report on studies related to Shiveekhuren border checkpoint. The feasibility for Khuut-Bichigt railway station was developed together with the 3rd bureau of China Railway. Moreover, Mongolian Railway plans to study and carry out projects that are economically significant and support freight transportation and logistics activities. For example, we plan to develop a project for manufacturing and assembling wagons. Around 6,200 trains are used in Mongolia right now. 44 percent of these trains, approximately 2,700 trains, have exceeded their service life. In other words, they have been used for more than 25 years. Using such old trains is very dangerous. Freight trains definitely need to be renewed in the near future. Train parks will have to be upgraded and expanded once railway tracks from Tavan Tolgoi-Gashuunsukhait, Shiveekhuren-Sekhee, Khuut-Bichigt, and Erdenet-Ovoot have been constructed in stages. Other railway projects specified in the State Policy on Railway Transportation will be launched as well. When these railway projects are completed, there will be a demand for approximately 10,000 trains. Importing this many trains means that our money will fly away to other countries. Therefore, we have formed a working group for developing a preliminary feasibility study for a freight train factory, which produces trains for both narrow and wide gauges, and repairs trains. The working group is currently developing estimates and studying practices of train factories in China, Russia, Ukraine, Germany, Kazakhstan and Uzbekistan. The preliminary feasibility study has been discussed and supported by the Scientific and Technical Council of the Ministry of Roads and Transportation. They acknowledged that the project would be economically beneficial. How large is Mongolian Railway's rolling stock right now? Our company operates with a total of 245 freight trains, two lift trucks, and nine locomotives with high capacity that were manufactured in Russia, China and the USA. We also own the Cargo Transshipment Facility in Zamiin-Uud soum of Dornogovi Province along with nearby 80 hectares of land. As for the basic railway structure, we have 33.4 kilometers of railway track between Khuder and Yuruu soums of Selenge Province with an additional 8.4-kilometer railway track across the Cargo Transshipment Facility. How is the construction of Transport and Logistics Center progressing? Mongolian Railway developed the plan for constructing this center. Just recently, our specialists visited Tianjin city of China within the scope of this project. They joined the 2016 Northeast Asia Peace and Development Forum held in Binhai, Tianjin city and presented speeches on the transit economic corridor of Mongolia, Russia and China. Our representatives introduced projects for Tianjin Logistics Center, Tavan Tolgoi-Gashuunsukhait and Khuut-Bichigt railway routes to heads of large Chinese corporations. 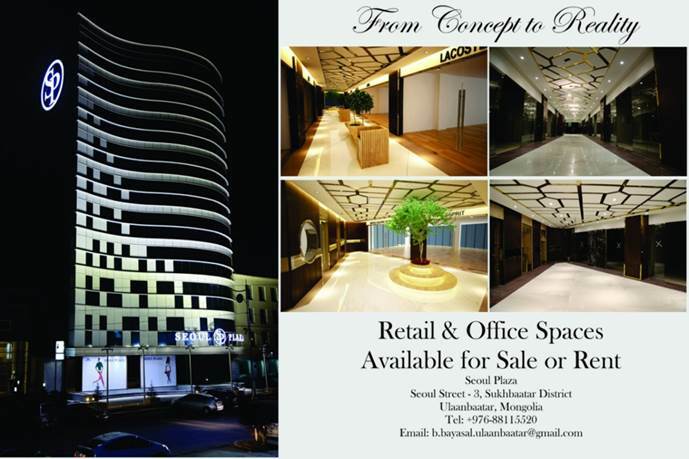 Once investment is resolved, a joint company will be established and construction will be started. Industrial researches required for operations are being conducted. We're working on economically significant projects for enhancing meat export, increasing domestic production of meat and supplying it to our third neighbor countries, producing final products from animal skin and hide, boosting sea buckthorn production, and packaging imported common food products. Opening these factories at Dongjiang Free Trade Port Zone in Tianjin city, which is near a seaport, will not only enable Mongolia to receive free trade zone incentives and get exemptions from customs tax but also boost export and reduce transportation and logistics costs. Mongolian Railway is constructing a railway through the New Railway Project. How is this project progressing? The construction of the Tavan Tolgoi-Gashuunsukhait railway track's lower structure is at 85 percent completion. We studied foreign investors, and currently we are negotiating with potential investors for the New Railway Project. We expect to see some progress in the eastern routes as the project for building Tavan Tolgoi-Sainshand-Khuut-Choibalsan route has been included in the list of projects to be discussed during Prime Minister J.Erdenebat's visit to Japan. We have prepared a presentation for it. The Minister of Roads and Transportation will accompany the Prime Minister during his visit as well. The public is split on whether a railway would benefit the nation. Quite a number of people complain that railways are only good for exporting Mongolia's wealth and resources to other countries. What's your opinion on this? I believe that based on accurate assessment of the current situation, Mongolia needs to develop a very good strategy for putting strategically important deposits into economic circulation and get the most benefits out of it. Everyone says it's important to construct railways, thermal power plants and industrial complex, but what's more important than that is identifying the right way and steps, as well as management, for developing these things. In my opinion, I think it's better to first build railways and earn profit from transporting minerals and then start large projects. Because Mongolia didn't do this, all projects were launched simultaneously and stopped at the same time due to lack of funds. I'm sure that everyone can see this. How do you cooperate with Ulaanbaatar Railway JSC? What are the two state-owned railway companies working on currently and plan to do in the future together? Besides transporting goods with Ulaanbaatar Railway with our own locomotives and equipment, we provide transport services to local entities and mining companies. We have been cooperating in every field, including in the expansion of railway transportation volume, reduction of workload, in boosting service quality, and increasing customer satisfaction. At present, Mongolian Railway and Ulaanbaatar Railway are collaborating on improving operations of the Cargo Transshipment Facility, built in Zamiin-Uud soum with a grant from the Japanese government to enhance transit capacity and quality of railway services. Our cooperation will continue to expand in the future. A professional team plays a vital role for conducting transportation operations. What kind of policy do you uphold in terms of human resources and how do you enforce it? That's right, a professional team is very important. The key to providing high-quality products and services is skilled personnel. Consistent to company policy, we're taking various measures to form a skilled team and train professional personal for future activities. Around 60 staff members, including engineers and technicians, were selected for iron ore transport operations and have been dispatched to rural communities. As part of our scholarship program, we sent 13 students to study and specialize in five different areas at a Chinese institute for transportation engineering, and another three students are studying through scholarship at the Transportation Institute of Mongolia. We cooperate with vocational education and training centers (VETC) to have people trained within a short period of time. For instance, eight students are studying at the Railway VETC through scholarship. A total of 500 people are being trained in railway industry occupations at VETCs in Nalaikh and Sainshand cities. What does Mongolian Railway plan to do in the future? Besides completing ongoing projects at the highest quality, we plan to assist the Ministry of Roads and Transportation on projects aimed to develop some 150 railway related rules and regulations, set standards based on international practices, and amend relevant legislations. CIMIC mining unit Thiess is using state-of-the-art mine mapping and surveying technology in a rare underground contracting foray in Mongolia. October 21 (Mining Journal) The world's biggest surface mining contractor hasn't put its name to underground hard-rock mining but now incorporates remnants of CIMIC's former Leighton Contractors underground business. It is working with Mongolia's Khishig Arvin on twin decline development at Oyu Tolgoi for joint owners Rio Tinto (majority) and the Mongolia Government. Extensive surface decline development, including 16.6km of tunnels and 35,000 cubic metres of large excavations to house conveyor transfer and drive stations, will link a conveyor system with underground mine workings. Thiess is using I-Site 8200 3D laser scanning technology from Australian mining technology company Maptek, as well as the supplier's I-Site Studio software, "with conformance reporting", for underground surveying and mapping. Spatial data collected can be used for geotechnical analysis, stockpile measurement, design conformance and movement tracking. October 21 (Mongolian Economy) B.Enkh-Amgalan MP submitted a proposal to parliament in August to establish a high-speed data centre in Ulaanbaatar connecting Asia and Europe, the reason being that international tech experts have expressed that Mongolia is in a suitable location for such a thing. Global tech giants have already started opening offices in the capital city within the framework of this project. Currently, Microsoft has opened a branch in Mongolia, while Google and Intel plan to follow suit in the near future. These three companies will place media storage and transmission equipment to start off. The MP who submitted the initial proposal said operations will begin starting from next spring. In addition, Mongolian companies working in the communications sector will receive the added benefit of being able to cooperate with these global leaders in information technology and communication. As for investment, the project initiator noted that public-private partnerships would be a good place to start. October 21 (gogo.mn) The United Nations' Green Climate Fund (GCF) board meeting was held at its headquarters in Songdo, South Korea on October 14th, 2016. During its fourteenth board meeting, the GCF reached a new milestone with the approval of USD 745 million in funding for projects to help developing nations tackle climate change. In addition to approving these funds, the GCF also added eight new Accredited Entities, including XacBank, thereby making it the first private entity from a developing country to receive accreditation. The Fund will promote the paradigm shift towards low-emission and climate-resilient development pathways. The GCF will do so by providing support to developing countries to mitigate their greenhouse gas emissions and to adapt to the impacts of climate change through its Accredited Entities. XacBank is not only the first private commercial bank to become accredited in Mongolia, but also worldwide. With the funding, the Bank has access to preparatory grant funding for projects and programs. XacBank will also be able to give long-term loans with low interest rates to projects organized by the Mongolian government, public and private organizations, as well as provide projects access to a guarantee fund. On this special occasion, XacBank CEO Mr. Bold commented, "We work by embracing our triple bottom line mission: People, Planet, Profit. In 2009, we created the very first Eco Banking Department in Mongolia's banking sector, thus reducing greenhouse gas emissions and energy usage in cooperation with Micro Energy Credit, and further cooperation with various international organizations such as: FMO, Deutsche Bank, EBRD, IFC, and Global Climate Partnership Fund. Accreditation from the GCF further legitimizes the core values and mission statement we stand by and demonstrates the contributions we have made towards bettering the environment. In addition to our commitment to the environment, the accreditation shows our integration of global standards in all areas of operations, governance, and social responsibility. Moreover, it is an entrustment given to us for making tangible changes in our region towards slowing down climate change." Individuals, governments, private and public entities, NGOs of all levels across the world have joined together in combatting climate change. Mongolia joined the United Nations Framework Convention on Climate Change (UNFCCC) and the Kyoto Protocol in 1993 and 1999, respectively. In the past 70 years, our country's average temperature has increased by 2.1 degrees Celsius. Due to climate change, the frequency of natural disaster increased by 1.5 times and the number of fallen livestock has reached 24.5 million, causing billions of MNT worth of damage. The crisis of climate change is a global responsibility. As such, XacBank sees it as our duty to make a real impact through climate finance. The Bank strives to create a greener, healthier environment for generations to come and will always continue to do so. The Green Climate Fund (GCF) is a fund within in the framework of the UN Framework Convention on Climate Change (UNFCCC) founded as a mechanism to assist developing countries in adaptation and mitigation practices to counter climate change. GCF was set up by 194 governments party to the UNFCCC, was given the mandate to help keep the planet's atmospheric temperature rise below 2 degrees Celsius. The Fund received pledges of approximately USD 10 billion equivalent in 2014, which has been exceeded. October 21 (news.mn) A Mongolian company, Solar Power International LLC, and Japan's Sharp Corporation and Shigemitsu Shoji Co., Ltd. signed a cooperation agreement for the first large-scale solar power plant enterprise in Mongolia in July. By introducing Sharp's technology and experience in solar power generation, the company believes that clean energy can be supplied and a reduction of greenhouse gas emission can be achieved in Mongolia, where coal fire power plants are still heavily relied on for energy. The installed capacity of PV modules for this solar power plant will be 10MW, and the annual expected power generation is 14,182MWh. October 21 (UB Post) President of the North America-Mongolian Business Council (NAMBC) Steve Saunders and his accompanying delegation were received by President Ts.Elbegdorj and other government officials to discuss how to expand their relations and cooperation, and the directions and tendencies of future cooperation. The main purpose of the NAMBC is to boost investment and economic cooperation between the U.S., Canada, and Mongolia. NAMBC was the first business organization established to build a bridge between Mongolia and the North American region, and has helped to increase Mongolian international trade and develop investment. The NAMBC delegation met with State Secretary of the Ministry of Foreign Affairs D.Davaasuren to discuss economic cooperation. D.Davaasuren introduced the Government of Mongolia's plan to restore its credibility with foreign investors and entrepreneurs, and to encourage them to pursue their interests in Mongolia. He stated that creating a suitable legal and regulatory environment for foreign investors and entrepreneurs in Mongolia is important. The NAMBC delegation said they hope that Mongolian investment will increase and that they will continue to collaborate with Mongolia. The delegation also met with Chairman of the Mongolia-U.S. Parliamentary Group G.Zandanshatar, delving into ways to attract foreign investment to Mongolia. Saunders pointed out that the new Mongolian government seems to be working actively, and said that the key to attracting foreign investment is ensuring government stability and having a vision for the future. Mongolia needs to pay attention to creating a favorable investment environment and ensuring transparency, Saunders added. G.Zandanshatar highlighted Mongolia's efforts to increase investment. "Mongolia has an immense amount of resources and opportunities to attract foreign investors. I'd like to highlight that Mongolia is already paying a great deal of attention to bringing stability to the nation and creating a favorable business environment. Our main target is not just developing mining, but to comprehensively develop agriculture and boost export volume," he said. Finishing their meeting, Steve Saunders invited G.Zandanshatar to attend the NAMBC's forum scheduled to take place in Washington, D.C., in April 2017. October 21 (gogo.mn) Mobicom corporation has officially launched iPhone 7 and 7 Plus today (Oct 21). iPhone 7 Plus is available for MNT 2,673,000 for 128GB. Mongolia is one of the best places for investment now. 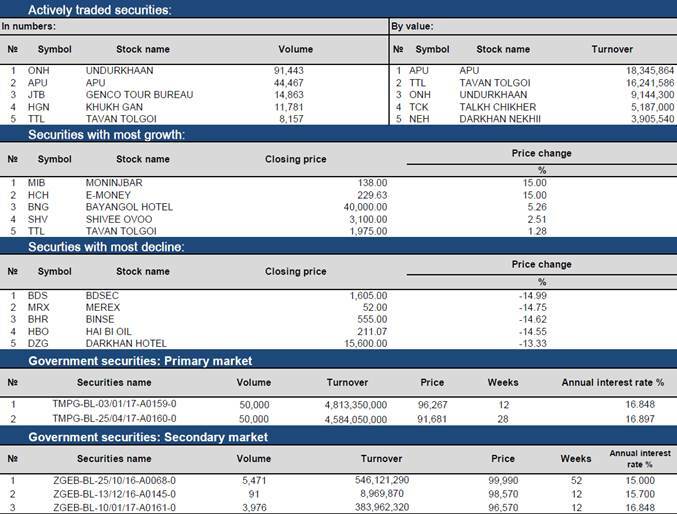 Mongolian Stock Exchange is sitting on multi-year lows; the entire market capitalization is less than US$250 million, and daily turnover is often less than US$1 million. The economy in Mongolia is growing rapidly, people who are focusing on this niche will become incredibly wealthy by the end of the decade. Mr. Tumur "George" Lkhagvadorj - His Excellency Tumur Lkhagvadorj is Ambassador of Mongolia accredited to Singapore and Non-resident Ambassador to the Philippines and Brunei Darussalam. Ambassador Lkhagvadorj is one of the leaders in introducing western contract mining and mineral processing technologies into the respective industry of Mongolia. He has listed several companies including Hunnu Coal Ltd. (ASX:HUN), Voyager Resources Ltd. (ASX:CJC) and Wolf Petroleum Ltd. (ASX:WOF) on Australian Stock Exchange and managed the development of Mongolian major coking coal deposit. Ambassador Lkhagvadorj holds M.A in International Studies from Canterbury University, UK, M.Sc in Mining and Earth System Engineering and B.Sc in Metallurgy and Materials Engineering from Colorado School of Mines, USA, as well as a Technical degree in Mineral Processing from Ukrainian Industrial Technical School. Mr. Ganbayar Dash - The current Governor of Batsumber soum since 2004. He is also currently the branch leader of Batsumber soum Mongolia People Party as well as an executive council member of the Tuv aimag government. From 2000 to 2004, he was the Chairman of Local Council in Batsumber soum. From 1980 -1990, he was agronomist in Batsumber soum. In 1979, Governor graduated from University of Agriculture of Mongolia and in 1997, he completed his Master Degree in Public Administration in Academy of Management in Mongolia. He is an expert in rural development and intensify cow farming business. Dr. Galbadrakh Baramsai - The CEO of MINDSET College. He also own various businesses in Agricultural, Hospitality & Tourism, and Construction. He is an expert in Technical Vocational Education and Training (TVET). He was instrumental in overseeing the reform of TVET in Mongolia when he was a director with the now defunct Mongolia TVET agency. After the TVET agency was subsumed under the Mongolia Ministry of Labor, Dr. Galbadrakh left to join the Mongolia Ministry of Road and Transportation as the Director General responsible for strategic policies and planning. He holds a PhD in Educational Research from University of the Humanities, Mongolia. Mr. Chong Fook Yen - An expert in workforce skills development and rural development through sustainable skills development. He has a Master Degree in Training and Development and has worked for various international developmental organizations and government agencies. He is currently the Founder and Chairman of MINDSET TVET College in Mongolia, a social enterprise which impart technical and vocational skills to rural unemployed and under-employed youths and adults. He has also setup a livestock farm in Mongolia and he is in the process of setting up a hotel. In addition to the above, he also supports several companies in government negotiations for infrastructure development projects in the Western Africa countries. October 23 (Financial Times) I live part of the year in London and part in Mongolia. My job is to research emerging markets for my property investment company, and most of my travel is to Mongolia, Myanmar, Thailand and Hong Kong. But I live in Chelsea in London for about four months every year and walk through Hyde Park to our offices in Mayfair each morning. We have offices in Yangon, Hong Kong, Singapore, and Ulan Bator, and I spend the rest of the year travelling. I must clock up about 100,000 air miles every year. I have travelled to so many places, I often forget I have visited them. In five days in September I visited nine US cities, including New York, Boston, Miami — meeting clients and advising on how to invest in emerging market real estate. I always take a night flight when I am travelling from Europe to Asia. This is when I catch up with the interior design press: Wallpaper and Monocle are the magazines I never miss. My company tries to bring international style to property in emerging markets. Because I travel so much, I choose pieces and artefacts from all over the world for decoration. For example, we have just sold a penthouse in Ulan Bator. The interior was based on a Spanish design but we included a television stand I found in Korea. We try to give designs a cosmopolitan slant. Mongolia is growing very rapidly — we have been there for 15 years and are one of the largest property developers in that country. It is important for me to understand it properly, so I often re-read two books: The Secret History of the Mongols, the oldest surviving literary text in that language, written in the 13th century, and Genghis Khan and the Making of the Modern World by Jack Weatherford. The way Mongolians operated 800 years ago gives insight into their local logic and world view today, which is fascinating. When I'm there, I spend my weekends in a lodge out in the countryside, where we have an investor retreat. We use Range Rovers to travel and we ride around on quads. That is my favourite time. I listen with Deezer, a streaming app, and I am an addict. It offers me 20 different kinds of moods, and its clever algorithm learns exactly what you like to listen to. I use it for the gym, for waking, sleeping — everywhere. Because my company is full of young people, I run the whole thing off apps. Skype, WhatsApp, WeChat — if you do business in China you have to use WeChat — and I use Uber in every city in the world. I use Airbnb for overnight stays, and I even use a micro managing business app for expenses called Expensify. I watch TV on mobile devices when I travel, and I like to catch up with the UK Channel 4 reality series Made in Chelsea — those people in that show hang out near where I live, but I am not in a hurry to meet them. I love Netflix. House of Cards (above), Vikings and other series keep me from concentrating on work. Marco Polo is gripping and it is related to Malaysia so I like it even more. House of Cards reminds me of the politics in my company. October 21 (Sustainability) Earlier this year, Sustainability consultants Catherine Grant and Nyamdorj Barnuud met with Mr John Langtry, Australia's Ambassador to Mongolia. There is a strong and growing relationship between Australia and Mongolia. Australia established diplomatic relations with Mongolia in 1972, with bilateral engagement continuing to grow following major economic reforms in the 1990s. The mining sector in Mongolia now accounts for almost 20% of GDP, and the Australian Government has estimated that it will provide $10 million in total official development assistance (ODA) in 2016-17 (Department of Foreign Affairs and Trade, 2016). Mongolia's economy is largely driven by its significant resource base and, as a developing democracy, Mongolia is well placed to continue making an active contribution to prosperity in the region. At the meeting, Catherine and Nyamdorj were able to introduce Mr Langtry to the range of consulting and training services offered by Sustainability, including our Exemplar Global Lead Auditor training program as well as our Certificate IV in workplace health and safety. They also spoke of the projects that we are currently undertaking in Mongolia. Our relationship with Mr Langtry strengthens Sustainability's already strong ties with Mongolia and establishes a promising base for future collaborations. October 23 (UB Post) Deputy Ulaanbaatar Mayor in charge of Green Development and Air Pollution J.Batbayasgalan met with delegates from Busan city of South Korean in Ulaanbaatar on Thursday. An agreement to establish friendly relations between Ulaanbaatar and Busan cities was inked at the previous meeting, which took place earlier this year in August, with a delegation led by Busan City Mayor Suh Byung-soo. As specified in the agreement, a working group from Busan city is visiting Mongolia's capital from October 18 to 21 to develop a proposal for some joint projects of the two cities. "We have many issues to resolve together. It's possible to cooperate on finding solutions to a multitude of issues in Ulaanbaatar, including air and soil pollution, transportation and logistics, infrastructure, and waste management," J.Batbayasgalan stated at the beginning of the meeting. "There are some projects and programs that are ready to launch at the Ulaanbaatar Development Corporation. We're pleased to study practices and introduce modern technology of Busan city and the Republic of Korea to Mongolia," added the Deputy Mayor. The Korean side responded, "Through the two cities' friendly relations, we're glad to be cooperating on some projects with Ulaanbaatar. As for waste management, we used to bury waste underground 30 years ago too. The volume of waste buried underground decreased after we started sorting waste. Now, we get energy by burning waste and weld with the emitted gas. Our representatives from the Korea Environment Corporation (KECO) will manage this matter." The Korean side also expressed interest in cooperating on short-term projects that can be implemented immediately as well as long-term projects. Ulaanbaatar and Busan have opportunities to collaborate and support one other in tourism, health and economic fields by making use of the recently launched direct flight between the two cities, a Busan city representative noted. Deputy Mayor J.Batbayasgalan gladly accepted the delegation's proposal and initiatives, and offered to acquaint them with associated agencies. "Our target for the next four years is to develop Ulaanbaatar into a business and tourism hotspot of Northeast Asia that incorporates unique traits of Mongolian customs and traditions. Therefore, it's possible to work together in tourism and other fields. I will especially assist you in getting familiar with associated agencies and organizations. I hope you fulfill your goals during your stay in Mongolia," affirmed the Deputy Ulaanbaatar Mayor. Despite being one of the most modern cities of Mongolia, the people of Ulaanbaatar have maintained practices, rituals and traditions passed on from their ancestors through centuries. During your trip, you too can experience and immerse in the Mongolian traditions. Whether you're a foodie or not, traditional Mongolian food can be quite scrumptious. Their specialty lies in mutton and they prepare anything mutton ranging from mutton soup to mutton risotto. Other food of theirs include various soups and dumplings. Mongolia is a Buddhist country and people all over Mongolia, including the ones in Ulaanbaatar, engage in spiritual activities. Tourists and foreigners are welcome in temples everywhere. During your trip you can take a 20 hour package train ride to visit various temples and spiritual centers across Ulaanbaatar. If you are thinking of going to Ulaanbaatar, July could be a good as this is when the largest Nadaam celebration occurs. Nadaam is a traditional sports festival consists of wresting, archery and horse racing. Alternatively, other times that you could consider traveling to Ulaanbaatar is during the Eagle Festival, the Thousand Camel Festival and the Kazakh Traditional Spring Festival (Mauryz). Scheduling your visit during the Mongolian festivals will make your trip a bit more exciting. Are you ready to jet set to Ulaanbaatar? October 21 (UNDP Mongolia) It is a great pleasure to congratulate the Government and people of Mongolia on the 55th anniversary of Mongolia's membership of the United Nations. Congratulations on 55 years of successful partnership! We look forward to even stronger relations in the years ahead. October 21 (news.mn) According to an interview with Shin Sang Kyun, First Secretary at the Embassy of the Republic Korea in Ulaanbaatar, published on the news.mn website on 17th of October, the number of Mongolians who applied for visas to South Korea has increased in recent months. A total of 34 thousand Mongolians in 2014 applied for visas to South Korea and 56 thousand in 2015. However, in first nine months of 2016, the number of applicants has increased sharply to 47 thousand. This has caused pressure on the consular services of the South Korean Embassy, which has been forced to extend the 'response time' for visa applications from one week to ten working days. The new rule came into effect from 17th of October. There are currently some 24,000 Mongolians living in S.Korea; these include married migrants, people working in the manufacturing sector and students. Ulaanbaatar, October 21 (MONTSAME) Vice Minister of Foreign Affairs B.Battsetseg received Ambassador of Belarus to Mongolia S.Chepurnoi on October 20 upon the latter's request. The dignitaries have exchanged views on issues related to enriching the bilateral ties with more tangible economic contents, strengthening legal grounds for bilateral cooperation, organizing a consultative meeting between the two Ministries of Foreign affairs in Minsk, and implementing high level visits to Mongolia from Belarus. YEREVAN, OCTOBER 21, ARMENPRESS. President of Armenia Serzh Sargsyan on October 21 signed a decree on concurrently appointing Sergey Manasaryan (Ambassador to China) Ambassador Extraordinary and Plenipotentiary to Mongolia (residence in Beijing), press service of the Presidential administration told "Armenpress". October 23 (UB Post) Mongolia's last three Prime Ministers all started their foreign visits with Japan. Mongolia was the third country that the current Prime Minister of Japan visited. The heads of state of our two countries have established a trend of prioritizing each other when they visit other countries. It demonstrates the strong political and economic relations between the two countries and their significance under Mongolia's third neighbor policy and Japan's view of Mongolia as its most important partner in Northeast Asia. The first free-trade agreement Mongolia concluded was with Japan, and its implementation started this year. Our expectation is that this agreement will be influential in accelerating significant growth and positive changes in foreign trade and investment. The leaders and business-minded people of our two countries have consistently sought out ways to combine Mongolia's natural resources with Japan's technological efficiency. There is a lot for our governments to focus on, fix, and resolve. I would like to share my observations on Prime Minister Erdenebat's two-day official visit to Japan on Oct 13-14. As Prime Minister Erdenebat's group was approaching Tokyo from Narita Airport, en route to Imperial Hotel in the heart of Tokyo and next to the Imperial Palace grounds, there was a blackout at 3:40 p.m. A press officer from the Ministry of Economy, Trade, and Industry reported later in the evening that the blackout was the first in the last 30 years and that it impacted approximately 580,000 households. The power came back online after 10 minutes, which was a relief to our embassy employees, who were preparing to receive the Prime Minister, as the hotel was connected to the city's power grid and the elevators started working again. It did not take long to restore electricity in other impacted areas. The President of Tokyo Electric Power Company (TEPCO), which was responsible for electricity in the impacted areas of the city, said the same evening that the blackout occurred because a fire broke out at one of their substations. He bowed and apologized for the inconveniences and the discomfort that was caused – electric generators, traffic lights, and underground transportation lines stopped working for ten minutes. It caused several traffic accidents and disrupted the city's activities. Through the media, experts explained very well to the Japanese, who has forgotten what power outages were, what happened and what caused the blackout. They explained that the power cables that TEPCO uses are 13 centimeters in diameter, with a metal conductor wrapped in layers of paper with insulator oil. The cables are buried underground, as opposed to installed as overhead lines. However, the underground cables have not been replaced for 35 years. They explained that the fire was likely caused by the oil getting through the layers due to a malfunction and igniting when encountering a spark. TEPCO announced that all their power cables, which run a total of 1,500 kilometers, would be replaced, as two-thirds of them have exceeded their lifespan. The day after the company informed the public of what actions they took and will take following the blackout, their stock (TYO 9501) went up in value and reached 420 JPY with an increase of 2.2 percent. This reflects how the Japanese stock exchange reacts to what is happening in real time. Also, the decision to replace over 1,000 kilometers of power cables is good news for a copper exporter like Mongolia. WILL THERE BE A BLACKOUT IN ULAANBAATAR? When the leaders of our country visit Japan, they often note and express deep gratitude to Japan for providing support during the numerous times Mongolia's power sector has faced difficulties. In the 1990s, when Ulaanbaatar used to have frequent blackouts that lasted for hours, the Japanese fixed the only power station we had then and rescued the residents of the capital city from freezing in their homes during winter. Today Mongolia's central electric power network faces a demand for 1,100 megawatts, but it only has the capacity to supply 900 megawatts. We have talked about building an additional power station for almost 20 years and had ten ground-breaking ceremonies for Thermal Power Plant 5. Yet, but nothing has actually been done so far. The government established an agreement to build this power plant with a Japanese-French-Mongolian consortium a few years ago. But, an expert from the Ministry of Energy has said that Prime Minister Erdenebat's government has decided to expand Thermal Power Plant 3 for 350 million USD, and increase its capacity to 450 megawatts. They have postponed the construction of Thermal Power Plant 5, which is expected to require 1.5 billion USD and have the capacity to produce 750 megawatts. What is true is that Ulaanbaatar still asks Russia for support during peak times of electricity usage. It also goes without saying, that if there was a major malfunction, we would not be able to restore power as quickly as Japan did. The Japanese company Marubeni has won a tender to build a 450-megawatt power plant next to the Tavan Tolgoi coal deposit. The plan is to provide the Oyu Tolgoi mine with 250 megawatts from this power plant and to increase domestic capacity by putting the electricity imported from China to domestic use. Also, Japan International Cooperation Agency (JICA) has made its first investment in infrastructure and will build a 50-megawatt wind farm in Umnugovi for 70 million USD. If these projects with Japanese involvement are delivered on time, there will be less likelihood of Ulaanbaatar experiencing blackouts. Prime Minister Erdenebat held formal negotiations with Prime Minister Abe last Friday and agreed to accelerate the development of the 2017-2021 action plan and determine a roadmap for the strategic partnership between Japan and Mongolia. Prime Minister Abe promised to support Mongolia generously in our mid and long-term development. Minister of Finance Taro Aso said that Japan is ready to provide soft loans to Mongolia if we receive a rescue loan from the International Monetary Fund (IMF) to overcome the economy's decline. During the visit, several agreements and memorandums of understanding were signed to implement initiatives, such as Energy Resources working with Sumitomo Corporation to sell and market coal, Tsagaan Chuluut Company collaborating with Suzuki Shukai to build a plant to produce batteries in Mongolia, and Dry Milk Co. working with Prisai to construct a small plant to make dry milk in the Mongolian countryside. Furthermore, a management agreement for the new airport being constructed in the Khushigt Valley was established. The government also made a payment of five million USD to Japan, which had not been made by the previous government, for developing a Tavan Tolgoi railway plan. Prime Minister Erdenebat noted during a business conference held at the Japanese External Trade Organization (JETRO) that an effective partnership between Mongolia and Japan can be achieved in the field of agriculture and farming. The conference was attended by representatives from 50 Mongolian companies and 240 Japanese businesses. This has all been done to improve and realize the potential of the economic relations between Mongolia and Japan. However, in order to truly realize this potential, the Mongolian private sector needs to do much more to balance the trade between our two countries. Besides our traditional economic industries, we need to do more in areas such as software development, information technology, and research and development. We need to pay more attention to developing the education infrastructure for those areas. We – the Mongolians – are confident that the high-level friendly relationship between Mongolia and Japan will have a positive impact on our economic relations in the near future. ACMS Speaker Series – Dr. Jeffrey L. Falt & Oyungerel Tsedendamba: "The Green Eyed Lama"
October 21 (news.mn) The first ever children`s museum, aims to develop logical thinking and knowledge of children, has opened in Shangri-La Mall, Ulaanbaatar. The museum is dedicated for 2 to 7 years-old children and allows children to play and learn. In other words, children are able to play with museum exhibits. Currently, the museum theme is architecture and decoration. Children`s museum is spreading in Asia recently and it was first founded in USA more than 100 years ago. Special features of children`s museum is, it provides both opportunities to learn and play. The first exhibition of our museum, Building buddies was produced in Toboggan design, Canada, based on long-term study. This exhibition helps to develop the logical thinking, movement and teamwork skills, stated by museum staff T.Oyuntulkhuur. The museum has planned to organize events to support parental participation and foster children`s creativity in further. "Building buddies" exhibition will open for the children until next summer and the official opening has scheduled on this weekends (Oct 22-23). October 22 (UB Post) In comparison to developed countries, Mongolia seems to be going backwards in terms of tobacco consumption. Although, according to the World Health Organization (WHO), we're not alone. Nearly 80 per-cent of the world's one billion smokers live in low and middle-income countries. This is contrasted by a very steep decline in tobacco consumption in developed countries. For instance, smoking rates in the United States dropped from 42 percent in 1965 to 18 percent in 2012. As of 2013, the smoking rate was 26.8 percent in Mongolia. However this number does not tell the whole story. Studies show that 49.1 percent, or roughly half of all Mongolian men, smoke tobacco regularly, whereas only 5.3 percent of women smoke regularly. What are the reasons for this gap? How dangerous is smoking to the future of our country? Mongolia has one of the highest number of male smokers in the world. In order to find out why, we need to look back at the declining rate of tobacco consumption in developed countries. As fewer and fewer people regularly use tobacco in more developed countries, the world's largest tobacco companies (such as Philip Morris International) shift their focus to developing countries like Mongolia. This, coupled with less than ideal enforcement of tobacco laws, makes tobacco use in Mongolia an epidemic. The loose enforcement allows children to have access to tobacco products, which means they are more likely to smoke as adults. The question of the gender gap also arises: Why are men more likely to smoke than women? It is not a slight gap between the genders, it is a chasm. The reason for this has been mostly attributed to cultural standards. In Asian countries, specifically Mongolia, tobacco is seen to be a more masculine thing. This can also be more logically explained with different perceptions about health among men and women. It has been long studied and reported that women have longer life expectancies. Numerous studies, including one conducted by Harvard Medical School, show that behaviors like smoking are a big factor in that life expectancy differential. Tobacco has been identified as a contributing factor to the largest number of non-communicable diseases (NCDs), the leading cause of death in the country. The dangerous amount of pollution in the city does not help either. According to atmospheric scientist Christa Hasenkopf, breathing the city air over the course of 12 months is equivalent to living in a home with somebody who smokes 60 cigarettes a day. This air quality epidemic largely affects the most economically vulnerable groups in UB. Since pollution is most rampant in the lower income areas of UB, and smoking is more prevalent in lower income groups, it does not bode well for their long-term health. Smoking does only affect men, but their whole families. Secondhand smoke kills more than 600,000 people a year. Pollution and secondhand smoke are the hardest on young children and elderly people. The problems tobacco poses for low income families are not only health related. A smoker in Mongolia would have to spend 2.7 percent of the national median income to purchase 10 of the cheapest cigarettes to smoke each day. This can add up to substantial amounts of money, which could have been otherwise spent on daily necessities. The problems with smoking do not seem to be a lack of awareness about its risks, but awareness can always be improved. The overall understanding of tobacco consumption risks has become better as people have begun to actively advocate against it. However, general knowledge of the harms of tobacco is limited. Many people focus on lung diseases, specifically lung cancer, when thinking about the effects of tobacco use. What many Mongolians do not realize are the other consequences of smoking, such as gum disease, which has been proven to increase the risk of developing heart disease. As mentioned earlier, the ease of access to tobacco coupled with neutral or positive perceptions and a high smoking rate among adults can push more children towards tobacco use. Boys from the ages of 13 to 15 have a 20.3 percent rate of smoking, while 8.3 percent of girls in the same age category report having tried tobacco. The rate amongst girls is higher than the rate among adult women. This is an alarming sign for increased rates of smoking. Even though laws prohibit the sale of tobacco to anyone under the age of 21, the law is hardly enforced. The sale of single cigarettes is also prohibited, yet many small stores continue to sell them individually. This is not to say the government isn't doing anything. Warning labels on cigarette and tobacco packaging is a big step forward in trying to combat tobacco use. Advertisement for tobacco is illegal and enforced relatively well. The 2013 law banning public smoking was another large step taken by the government. However, trying to combat large tobacco companies can be an insurmountable task for developing countries like ours. The combined revenues of the world's six largest tobacco companies in 2013 were 342 billion USD, 97 percent larger than the GDP of Mongolia. This gives tobacco companies the power to disregard the actions of small states trying to combat tobacco consumption. The use of lobbying is commonplace in order to loosen up restrictions. Going back to the gap in tobacco use by gender, trends like this can have a larger impact on a country, including national security. It would be hyperbolic to say that smoking directly affects Mongolia's national security, but looking at long term trends – including a seven year gap between life expectancies for men and women – and factoring in the gap in consumption, we're seeing alarming trends. What all of this shows us is that the key to stopping the tobacco epidemic is cutting consumption by men. Adult men have the highest rate of smoking, and this can have a major effect on other groups. The normalization of tobacco can lead more children to smoking, and second-hand smoke is harmful to everyone. As cliche as it sounds, awareness seems to be important. Perceptions of tobacco need to be changed, and more people need to be educated on the health risks it can cause. Doing that, while simultaneously working to further combat tobacco use with legislation, can have a significant impact. October 21 (Vogue) Even at age 13, Aisholpan Nurgaiv was a mighty force to be reckoned with. The inspiring young starlet of The Eagle Huntress arrived to the Landmark Sunshine Cinema on Thursday night for the New York City premiere of the documentary hosted by the Cinema Society. Directed by Otto Bell with Daisy Ridley playing narrator, the film follows Nurgaiv as she trains to become the first female eagle hunter in 12 generations of nomadic Kazakh herders living in the Altai mountains region of Mongolia—one of the most remote regions in the world. "I was sitting in my cubicle at work, and I saw a photo essay of Aisholpan practicing with her father's bird taken by a young Israeli photographer named Asher Svidensky," Otto explained of how he first discovered his new muse. "They were just so gorgeous; they looked like a painting." Shortly thereafter, he was on a transatlantic flight to Mongolia. "The first day that I arrived, her father said to me, 'We're going to go steal an eagle from the mountainside—is that the kind of thing you want to film?' And that became the first act." Ridley's role came at the 11th hour when, the night before Sundance Film Festival, the Star Wars actress put in a phone call to Otto expressing her interest in the project, which, at that point, was purely English subtitled. "She's got such a beautiful voice, and it really lifted the film but also lowered the age limit for audiences," Otto said. Ridley was outfitted in a ladylike frock by The Row, grounded by a pair Neil J. Rodgers strappy sandals. "They're comfy, and I feel glam," she said. "I hope audiences will walk away with the feeling that anything is possible. That if you work hard and persevere, you can do whatever you want to do, and as long as you're making yourself happy, it can have far-reaching consequences." Attendees, including Russell Simmons, Ann Curry accompanied by daughter McKenzie, and voice of Dora the Explorer Fatima Ptacek, didn't bother to hold their applause until the end, clapping at several particularly triumphant moments of the film and well into the final credits roll, set to an original ballad, "Angel by the Wings," by Sia. Nor did they shy away from asking Nurgaiv to pose for photos together at the celebration that followed on the rooftop of The Jimmy at the James Hotel. For the occasion, the trailblazing teen paid homage to her Mongolian roots in a traditional velvet coat, replete with a magnificent eagle embroidery on the back, and a fur trapper hat. And when asked what "girl power" means to her, Nurgaiv succinctly replied through her translator: "bravery." Clearly, she's a rare bird whose fearlessness extends to her bold sense of style and beyond. October 22 (Ze Wandering Frogs) The Tsaatan Nomads, or the Dukhan as they are also known, live high in the Ulaan Taiga mountain range of Mongolia. The region is bordered by Russia to the west, the Darkhad Valley and Lake Khövsgöl (Khövsgöl Nuur) to the east. Through millennia-old traditions, the Tsaatan livelihood has been tied to their reindeer herd. Today the roughly 500 Dukhan left are some of the last of the reindeer herders in the world. Reaching the Tsaatan camp is a challenging endeavor as it takes from three to six days from Ulaan Baatar. It starts with a 12-hour bus ride from Ulaan Baatar to Mörön (also known as Murun). Then you embark on a 12-hour ride on rough dirt roads and river crossing from Mörön to Tsagaan Nuur in a Russian minivan. Finally, you horse ride one to three days through steep rocky forest slopes and muddy taiga – swampy coniferous forest area – before arriving at their location. But once we arrived at the taiga camp, I quickly forgot any soreness and was no longer tired. We had made it. We had reached the nomadic people of the reindeer – the Tsaatan. Just mentioning their name felt extraordinary. We took this trip with 2 other families, so we had 15 in total – 9 of those being kids. We arrived on Sunday evening and checked in to the simple, but lovely Oasis Guest House. It ended up that our group was the only one there, this was good as with so many kids it wasn't always very quiet. The guest house has a main building where we stayed and gers to stay in during the warmer months. Monday morning we were up and enjoyed the toast and tea provided. Our first stop was a Girls Home run by Flourishing Futures. Due to many different circumstances these girls need a safe place to live and it is provided for them here. Most were in school on this Monday morning but we played and did crafts with the ones that were there. We then visited the community center base for the organization and went up on top of the hill nearby. From there you could see a 360 degree view of all the Ger District and expanse of the people living there. People living in this area struggle to meet their daily needs and have often just moved in from the countyside. We spent the afternoon taking in some of the sites of the city of UB. It was a chilly day! October 21 (ANS – Ulaanbaatar) – The day so longed-for by the Salesians and the Salesian Family in Mongolia has eventually come; the youth and staff of the Salesian presences in the country are eagerly waiting to welcome the Rector Major, tomorrow, October 22nd. His visit, the first of a Successor of Don Bosco to the country, has been arranged in every detail so as to allow Fr. Ángel Fernández Artime to get acquainted, during the two days of his stay, with Mongolian culture and customs. Preparations started from the day when the visit was announced, about nine months ago, and now that his arrival is imminent, the Salesian community of Ulaanbaatar, together with students and teachers, are at work to give to the visit a typically Mongolian taste. Tomorrow, when Fr. Á.F. Artime will go from the airport to Salesian house of Ulaanbaatar, he will be given a traditional Mongolian welcome, with the presentation of a Hatag (a blue scarf) and some mares' fermented milk. Then he will be accompanied to the Ger (the traditional Mongolian house), expressly prepared for him. A ger is made with wood and sheep wool and keeps the house warm also in the rigid winters of Mongolia. It generally has a round shape and is supported with two to eight artistically decorated wooden pillars; it has an opening at the centre of the roof, to let out the smoke of the stove that is lit day and night and keeps the house warm and comfortable. Around the ger, for safety reasons, there is always an enclosure and often also a dog. According to traditions, only the head of the household can sleep on the bed, whereas the other members of the family sleep on the floor. Besides, being a traditionally patriarchal society, great honours are bestowed on the head of the family; the Rector Major, as a distinguished guest, will be given the same attention and honours as the head of the household. Finally, when on Sunday morning the Rector Major will arrive in Darkhan, he will wear the Dale, a traditional dress, and will ride a typical camel of the region. The Provincial Delegate for Mongolia, Fr. Paul Leung, has thanked in advance the Rector Major for the joy he will bring to the Mongolian people: "A warm welcome to you, dear Fr. Ángel, our beloved Rector Major". September 15 (Team BlackSheep) Escaping from civilization to Mongolia. Meeting with the chillest people on the planet and seeing places of unimaginable beauty and loneliness. No better way to document this way of life than with a TBS Discovery Pro! You can enjoy this video in 1440p@60fps with the 'Chrome' browser. Feel free to like, share and comment the video. October 21 (iNews) Hundreds of snow leopards are being killed illegally each year across the high mountain ranges of Asia, raising concerns that they could become as good as extinct in the coming years. There are only thought to be about 4,000 of these majestic creatures left and with as many as 450 being killed each year their outlook is extremely bleak, a new report warns. Snow leopards are sought by poachers for their thick fur as well as their bones and other body parts, which are said to have medicinal properties. However, poaching only accounts for about a fifth of killings. The majority are motivated by revenge, being carried out by locals in retaliation for livestock deaths, said the report, by WWF-UK and Traffic, the wildlife trade monitoring network. "This analysis confirms the worrying scale of illegal killing of snow leopards. It's an urgent wake-up call," said James Compton, senior programme director with Traffic. The solitary, elusive and fantastically-camouflaged snow leopard, each with its fur uniquely patterned by dark rosettes and spots, is found across 12 countries that sweep around the Himalayan and Tibetan plateaus. These include China, Mongolia, Pakistan, India and Tajikistan – which together account for more than 90 per cent of known poaching – as well as Kazakhstan, Russia, Nepal and Bhutan, where the deaths are more frequently due to retaliation. With expanding human and livestock populations, snow leopard habitat is shrinking and prey is harder to come by. This means that conflict with these communities becomes likely, as snow leopards are forced to kill livestock. These communities often retaliate and kill snow leopards. A common way to do so is to place snares in the habitat. These snares result in various injuries to the snow leopard, in some cases it loses its leg which means it cannot hunt. October 22 (Popular Science) City dwellers' favorite scruffy friend, the brown rat (Rattus norvegicus), causes $19 billion dollars in damages around the world every year. Yet for an animal that is responsible for so much havoc, we know surprisingly little about it. Including how it came to own the globe (we just think we're in control). So a team of researchers from Fordham University conducted the first ever large-scale genomic study of the brown rat, and created a rough map of the routes the rodent immigrant took to every continent except Antarctica. It was published this week in the Royal Society's journal Proceedings B. The brown rat and its smaller cousins, the black rat (Rattus rattus), and the house mouse (Mus musculus), are the three most successful invasive mammals on Earth. (Coincidentally, they also have the best scientific names.) But whereas the black rat and house mouse have followed human agricultural expansion for millennia, the brown rat didn't venture out of its native China and Mongolia until hundreds of years ago, riding the waves of global trade to every corner. For the past three years, researchers of the Munshi-South Lab at Fordham University collected tissue samples from 314 rats across 76 different locations from around the world. Some rats were field-trapped, some were from museums, and some were picked up at wildlife markets. Their genomic analysis of the samples, led by ecologist Emily Puckett, unveiled a story of brown rat migration that followed five major routes out of East Asia. Soil dust particles emitted from agricultural areas contain considerable mass fractions of organic material. Also, soil dust particles may act as carriers for potentially ice-active biological particles. In this work, we present ice nucleation experiments conducted in the AIDA cloud chamber. We investigated the ice nucleation efficiency of four types of soil dust from different regions of the world. The results are expressed as ice nucleation active surface site (INAS) densities and presented for the immersion freezing and the deposition nucleation mode. For immersion freezing occurring at 254 K, samples from Argentina, China and Germany show ice nucleation efficiencies which are by a factor 10 higher than desert dusts. On average, the difference in ice nucleation efficiencies between agricultural and desert dusts becomes significantly smaller at temperatures below 247 K. In the deposition mode the soil dusts showed higher ice nucleation activity than Arizona Test Dust over a temperature range between 232 and 248 K, and humidities RHice up to 125%. INAS densities varied between 109 and 1011 m-2 for these thermodynamic conditions. For one soil dust sample (Argentinian Soil), the effect of treatments with heat was investigated. Heat treatments (383 K) did not affect the ice nucleation efficiency observed at 249 K. This finding presumably excludes proteinaceous ice nucleating entities as the only source of the increased ice nucleation efficiency. October 21 (news.mn) Mongolian coach D.Enkhbaatar will train Kazakhstan's national female judo team. He has previously worked with G.Otgontsetseg IMS, an Olympic bronze medalist, who has represented Kazakhstan since 2015. D.Enkhbaatar signed an agreement to train the Kazakh team until the 2020 Tokyo Olympics. He starts work in November. Ulaanbaatar, October 21 (MONTSAME) B.Chimedtseren won the gold medal in men's -120 kg category of the Asian Bench-Press Championships 2016, held in Tashkent on October 14-21. The lifter bench-pressed 322.5 kg. In men's 105 kg category, L.Barkhasbaatar grabbed the bronze medal, having pressed 257.5 kg. In this weight category, two athletes from Kazakhstan secured the gold and silver medals. Ulaanbaatar, October 21 (MONTSAME) The Chinggis Khaan-Ulaanbaatar Cup is taking place these day at the Central Palace of Sports. The International boxing competition attracts 61 men and 24 women athletes from Mongolia, Russia, China, Hungary, Singapore and Uzbekistan. Today, the semi-finals are underway. The boxing tournament, which was once called the Ulaanbaatar Cup, has been resumed after 16-year break. October 21 (Asian Boxing Confederation) The Chinggis Khan Cup began in the capital city of Mongolia in Ulaanbaatar with its quarter-final contests where a lot of powerful boxers proved his bests in the opening day. Mongolia's Rio 2016 Olympian Enkh-Amar Kharkhuu injured in his debuting contest therefore his teammate Nurlan Askhar delivered the main sensation of the quarter-finals. Mongolia's national team member Ariunbold Ganselem is the country's No.2 at the Light Flyweight class (49kg) behind Rio 2016 Olympian Gan-Erdene Gankhuyag. The National Championships silver medallist boxer had to do his very best to beat his teammate relatively unknown Iderzaya Eldevochir in the quarter-final of the lowest weight class but finally his hand was raised. Russia's Bator Gomboyev knocked down Singapore's Commonwealth Youth Games quarter-finalist 19-year-old Elansharan Prithiv Raaj three-times in the first round therefore the referee confirmed his TKO success in their Light Flyweight class (49kg) contest. Uzbekistan's WSB talent Nodirjon Mirzakhmedov controlled the first two rounds against Mongolia's Munkh-Erdene Damdindorj and his efforts were enough to beat the local boxer. Mongolia's Summer Universiade winner Enkh-Amar Kharkhuu competed in the Rio 2016 Olympic Games and he was the main favourite for the gold medal at the Flyweight class (52kg). The 24-year-old Kharkhuu led after the first round against former National Champion Nurlan Askhar but injured in the second round after his opponent's blows and the ringside doctor stopped their contest. Askhar's triumph was the main surprise of the quarter-final stage of the Chinggis Khan Cup. Uzbekistan's National Champion and WSB team member Abrorjon Kodirov is only 21 now but he has got more than enough experiences to beat anyone at the Flyweight class (52kg) in the Chinggis Khan Cup. He opened his participation in Ulaanbaatar against Mongolia's Jantsanperenlei Bold and controlled all of the rounds against his local rival. Russia's Bimba Khankhayev also delivered strong performance against Singapore's Hafiz Muhamed and secured his place in the last four at the Lightweight class (60kg). Mongolia's two-time Youth National Champion 19-year-old Misheelt Battumur is a great prospect in the Central Asian country and delivered a sensational performance against Uzbekistan's Chemistry Cup silver medallist Burgut Khodjibayev in the quarter-final of the Lightweight class (60kg). The young Mongolian knocked down his Uzbek rival in the third round which decided their close bout and Misheelt Battumur advanced to the next stage. Mongolia's Rio 2016 Olympic Games quarter-finalist 19-year-old Erdenebat Tsendbaatar attends at the Lightweight class (60kg) this time and did not give any chance to Shinechagtaga Zoltsetseg in their quarter-final. Mongolia's next Rio 2016 Olympian boxer Baatarsukh Chinzorig was too strong for Mongolia's two-time Youth National Champion 18-year-old Batkhuyag Sukhkhuyag therefore the referee confirmed his TKO success. Hungary's National Championships silver medallist 23-year-old Milan Fodor also delivered strong performance and eliminated Mongolia's Purevsuren Tsenenchimed at the Light Welterweight class (64kg). Mongolia's new face in the same category Bayarkhuu Ganbaatar stopped Russia's Bair Budashkayev after three knock downs while Uzbekistan's AIBA World Boxing Championships bronze medallist Elnur Abduraimov had a big battle against Mongolia's ASBC Asian Confederation Youth Boxing Championships silver medallist Norovbal Otgontumur in the quarter-final. Uzbekistan's super talented 19-year-old lady Maftunakhon Melieva continued her nation's successes in the Chinggis Khan Cup after beating Mongolia's Shinetsetseg Uranbileg who moved back to the Lightweight class (60kg). Her teammate ASBC Asian Confederation Women's Boxing Championships silver medallist Shakhnoza Nizamova also defeated a national team member Mongolian boxer, Erdenetuya Enkhbaatar in a narrow contest. October 23 (Missology) Mongolia has selected it Miss World candidate last night, October 22 and the lucky girl who will soon fly to Washington D.C. is Bayartsetseg Altangerel. In case her name sounds familiar, well she had represented Mongolia in international pageants before. She was Miss Earth Mongolia 2015 and she was one of the Top 16. She also competed at Miss International 2014 but she was unplaced. Definitely her vast experience in international pageantry will boost her bid for Mongolia's first ever Miss World crown. On top of that, Bayartsetseg is a cast member of Netflix's hit series Marco Polo. She wants to pursue her acting career further and is setting her sights on Hollywood. At 25 years of age, Bayartsetseg Altangerel stands 5'9″ tall. She spearheaded a community based environmental campaign and now she is co-running a mentorship program for orphan children. October 21 (news.mn) A total of six thousand people have already seen the performance of the visiting dolphins in Ulaanbaatar since 12th of October. The travelling dolphin family (Vasya, Katya and Disen') will be staying in the Mongolian capital for a month. The 500-seat aquatic circus of the 'Moscow Dolphinarium' opened in the city on 12th of October at the National Amusement Park. The organizers are providing the aquatic mammals with a warm 'home' during stay their stay. It is a well-known fact that Ulaanbaatar is the coldest capital city in the world; the night temperature this October has already dropped -10 deg C. The dolphin family is staying in a three meter deep pool with a total volume of 500 cubic metres containing warm +18C temperature water. The three dolphins and one seal are performing every Wednesday, Thursday and Friday at 18.00 as well as three times a day at weekends at 12.00, 15.00 and 18.00. Tickets cost MNT 10-30 thousand. The dolphins sing songs, dance, draw and, of course, jump through hoops. The Aquatic Circus has a staff of five, including two animal trainers and one helper. When they arrived from Russia, they brought nearly five tonnes of fish with them for the animals to eat. October 21 (news.mn) The British-American dance band 'Londonbeat' along with the German dance duo 'La Bouche' are to perform in Ulaanbaatar next month. The bands are considered as the 'kings of the Euro-Dance genre' and had hits in the 1990s. A concert - '90's pop legends: Londonbeat & La Bouche' will be held at the UB Palace on 3rd of November. The next evening 'La Bouche & Londonbeat Disco Night will take place at the Crocus event hall. October 21 (gogo.mn) This year's Order of Chinggis Khaan will confer to Mongolian State Honored Artist, opera singer G.Ariunbaatar. As customary, on the occasion of the birthday of Chinggis Khaan and the National Pride Day, an outstanding figure of Mongolia who contributed to strengthening the independence and sovereignty, studied statehood and historical tradition of the country is awarded with the supreme state prize of Mongolia the Order of Chinggis Khaan. In 2015, G.Ariunbaatar awarded the first prize of XV INTERNATIONAL TCHAIKOVSKY COMPETITION in the category of male voice. Previously, Order of Chinggis Khaan were handed over to former Preseident P.Ochirbat, composer B.Sharav, former Prime Minister D.Byambasuren, former President N.Bagabandi, former Member of Parliament D.Demberel, former Prime Minister P.Sodnom, scientist Kh.Namsrai and writer G.Mend-Oyo. October 21 (MONTSAME) The Morin khuur registered in the UNESCO List of Cultural Heritage in 2003 has been widespread among Mongol people since early 13th century. The horse-headed instrument consists of a trapezoid wooden-framed sound box to which two strings are attached and their strings are made from hairs from horses' tails. From ancient times the musicians used to create Morin khuur themselves to play it. The traditional playing method of low bass gives the sound of Morin khuur to perform within a diapason of whole 4 octaves in Mongolian yurt and in the houses. Master instrument makers of Morin Khuur have evolved the traditional design of the musical instrument to meet the present requirements. Thanks to such modifications the original diapason of Morin khuur has been expanded. Nowadays, horse tail from which the strings had been made are replaced with nylon. This has allowed the range of sounds and the tone of the sounds of the Morin khuur increase and enabled to play the Morin Khuur both on the stage and open air. The diapason of the Morin khuur fluctuates from lower octave "Fa" to the 3 octave "Fa". Morin khuur makers have created the traditional musical instruments with two sizes called "dund garin – middle-sized" and "ikh garin – big-sized". The playing methods for these two kinds of Morin khuur is similar to that for European Violoncello and Alpha Violin. Thus, the Mongolian Morin khuur has soprano, alto and baritone sounds and enriches the musical culture of our time. October 21 (UB Post) Altai Ethnic Music and Dance Group is a six-member band, formed in November 2011, that takes the "ethnic" music label to new heights by treasuring and preserving indigenous Mongolian musical traditions. The band is named after the "Altai" harp, a curved harp dating back to the 7th century that was discovered at Jargalant Mountain in Mankhan soum of Khovd Province, in 2008. The band's founder was pivotal to the harp's restoration and reintroduction to the Mongolian music archive. Altai has performed at UNESCO Hall and in Germany, France, Turkey, the Sakha Republic, the Russian Federation, and China's Inner Mongolian Autonomous Region. Their awards of note include the "2015 Best Group" prize of the World Throatsinging Association and the Grand Prix from the Olonkho Festival held in the Sakha Republic. There are some 60 songs in the band's repertory. This year, the band released their first album, "Zolgoy Doo", meaning "Let's Greet" which can be found at Hi-Fi Records in Ulaanbaatar, and online on iTunes, Spotify, Deezer, Google Play, Tidal and Amazon Music. Altai is A.Sanchir (morin khuur, female vocals), B.Baasanjargal (harp), M.Davaadalai (khoomii, tsuur, harmonica, bamboo fiddle, drum), T.Arvan (khoomii, morin khuur, male vocals, rhythm), B.Gurbazar (bii biyelgee, khoomii, harmonica, rhythm), and B.Ganzorig (bii biyelgee, ikel khuur, rhythm). As Altai celebrates its fifth anniversary this year, we interviewed D.Ganpurev, founder of Altai. What was it about the discovery and reproduction of the harp found in 2008 that inspired the founding of Altai? When the remains of an ancient harp were found in 2008, I did my research. Historically, it was the second unearthing of an ancient instrument in Mongolia. The first was a harmonica made of bone. The second was the curved harp. We named it the "Altai harp" because it was found in the Altai Mountain Range. After a lot of research, I decided that the instrument should be made known to the public, and I wanted to do that through and indigenous musical group. I could have popularized the instrument by introducing it through modern musicians, but Mongolian folk – indigenous music – is familiar and close to the hearts of Mongolians. So, I gathered these indigenous musicians in October 2011 to initiate the idea of an indigenous musical group which could popularize the Altai harp. On November 11, 2011, a day when six 1s collided, we officially established the band. That day we determined our mission, which was to reintroduce the forgotten and lost traditions and indigenous culture of Mongolian nomads. This year, Altai celebrates its fifth anniversary, for which we've released our first album and staged a concert. Since the establishment of Altai, we've been accomplishing our goal. So far, we have reignited three different cultural phenomena: the Altai harp, the Ahu harp, and Toirom (circle) dance. The original Altai harp is kept at the National Museum. The Ahu harp is an ancient instrument which was played in the royal palace, an forbidden from being played for the public. We made a reproduction of it, and now we can actually play an instrument that was only played for kings. The harp is a musical instrument that has long been played and developed by Mongolian nomads. The third specialty of Altai is Toirom dance, which dates back to the Neolithic Age. Many sources, including petroglyphs and the Secret History of the Mongols, make references to it. Mongolian folk culture has been shrunk to a familial level, but Toirom dance is something that unites families. As such, we will continue expanding and enriching attitudes toward folk and indigenous traditions. Is the production of traditional instruments something that's being treasured and continued? There is no preserved technology for making an Altai harp or an Ahu harp now, because the tradition was lost over time. The discovery of the Altai harp merely indicates that Mongolian nomads played a bowed harp, so we worked on the artifact to come up with a reproduction. The Altai Mountains are home to diverse fauna, including ibex. When we reproduced the Altai harp, we designed the curve of the harp to be inspired by an ibex horn, which is a pretty rare object. The real horns of an ibex would be too big, so we crafted it from the horns of cows. Many of the band's members are carrying on family traditions in music. What kind of formal training is available to musicians who play traditional instruments? Training for playing all traditional instruments is available at the Mongolian Music and Dance College, if one aspires to be a professional musician. Some 90 percent of the musicians in Mongolia are graduates of the Music and Dance College. Because the expertise in music of Altai's members derives from family traditions, they should be perceived as indigenous artists. They've inherited the legacy of as many as 12 generations. They weren't trained in college, but the traditions are in their blood. The majority of the band's members are from provinces outside of the capital. Does a closer connection to a traditional Mongolian lifestyle change the way that the music Altai plays is understood by its members? Ulaanbaatar, October 21 (MONTSAME) The Faith ("Itgel" in Mongolian) is to be screened at the ArcLight Culver City cinema on at 9.00 pm of October 27, the US time. Mongolian films – The Faith and Mother are being nominated for the Audience Award of the Asian World Film Festival. The previous year's winner of the Audience Award was "Thief of Mind" ("Bodlyn Hulgaich"). The festival will take place between October 24 and November 1, having more than 50 nominees for 7 nominations. The Faith tells a story of Itgel, an ordinary public servant, who gets a sudden boost in his career and joins the "minister's team," where his signature decides many people's lives. Despite his influential new post, he fails to buttress his friend Akhbayar's most important project. While anguishing over it, he learns that he has a terminal illness. What would you do if you were going to die tomorrow? Can you let your friend's life crumble, leave your parents and loved one behind without disclosing the truth to them? Mongolia is high in the world corruption index. The film reveals how young public officials fall victim to the current status quo of endless corruption and reminds the viewer of the fact that one is remembered for what he/she were and not what he/she had. Watch: Eric Nam Is Just As Lovable While Roughing It In Mongolia On "Law Of The Jungle"
October 22 (Soompi) Regardless of what country he's in, it looks like you can't help but smile when you see Eric Nam! The October 21 episode of the SBS variety show "Law of the Jungle" follows the cast in Mongolia, including Kim Byung Man, Ye Ji Won, Park Se Young, Lee Chun Hee, Kim Min Kyo and BTOB's Changsub. Kim Byung Man and the team must sleep outside and they wake up looking disheveled. As he wakes up, Eric Nam sleepily announces to the camera like a reporter, "This is Eric Nam, who lives in Mongolia." Lee Chun Hee, Park Seo Young and Eric Nam decide that they will go hunt for ducks and so they ride on horses to find them. Although the three on horseback make for an impressive picture, Eric Nam's horse is the only one who refuses to listen to him and so he ends up having to get off the horse and lead it along. Even after arriving at the lake where the ducks are, they realize that it was much too difficult. The sling shot that they brought to shoot them was too weak and the lake was surrounded by bugs. In turn, they give up on hunting ducks and instead go rest on a grassy hillside, where they discover an herb that is used in shampoo. Lee Chun Hee and Eric Nam have a competition to see who can be the funniest with their unwashed hair and the results are quite hilarious! Eric Nam gets a bit goofy towards the end which makes the others laugh, and he yells, "I'm hungry!" Check out funny clip below! TOV PROVINCE, Mongolia, October 20 (Nikkei Asian Review) On the vast green Mongolian grasslands, something unexpected is happening: Enterprising nomadic herders have started using Airbnb to reach out to a world beyond their pastures, promoting their humble yurts as accommodations to a growing number of intrepid tourists. It is a startling move in Mongolia, where the digital divide is massive. According to the World Bank, only 27% of the population uses the internet, and low-income families, the elderly and those in rural areas often lack access. Still, some nomadic herders are jumping over the divide to connect to a global market, promote their unique lifestyle, book homestays and generate additional income streams for their households. "We got into tourism because we wanted to show our nomadic lifestyle and traditions," said Oyunchimeg Shuurai, a nomadic herder who offers her family's yurt, called a ger in Mongolian, as tourist accommodations. Oyunchimeg, her husband and their three children live in an idyllic pastoral setting 80km outside the capital city of Ulaanbaatar. The family has been hosting tourist homestays since 2004, but this is their first year listing their ger on Airbnb. Although they listed it only for the peak tourism season between June and August, they received an enthusiastic response. It is a trend that holds some significant implications for the national economy. Airbnb combines two sectors that the Mongolian government is keen to develop: the digital economy and tourism. In a nation that is overly reliant on mining, with mineral and metal products making up roughly 90% of the nation's total exports, policymakers see the necessity of diversifying the economy. CELLPHONES GALORE, BUT ... Although still in its nascent stage, Mongolia's digital economy has begun growing in recent years, but only in fits and starts. While tech penetration is widespread in some ways, access to the internet still lags far behind most Asian countries. While Mongolia ranks a surprising fifth in the world in terms of mobile phone use -- with an estimated 5 million mobile subscriptions in a country of just 3 million people -- only 1 million people have access to the internet, according to official statistics from March. This structural problem will likely prevent Airbnb tourism from taking off quickly among herders. Currently, the few such herders who are using Airbnb are not only forward-thinking but also privileged. They are lucky enough to have internet access and the language skills to write listings in English -- or have family and friends who do. But Oyunchimeg thinks the digital trend is gathering momentum. "It'll grow soon," she said. "More herders are using the internet. My husband uses it on his mobile phone every day to check the weather." This is the way it starts in a place like rural Mongolia: Small, innovative habits based on daily necessity give way to grander designs. Almost every nomadic herder in Mongolia now has a solar panel array, which provides power for common items like mobile phones and televisions with satellite dishes. Some have also invested in portable washing machines, refrigerators and freezers -- all of which run off of gas generators or solar-fed batteries. But when one leads a nomadic life, minimalism is an asset; too much "stuff" can bog you down, and immobile technology infrastructure, such as fiber optic cables for fast internet, is useless. Only wireless internet connections can fit easily into a nomadic lifestyle. As a result, the Communications Regulatory Commission of Mongolia is rolling out 4G LTE mobile technology across the nation this year. The national postal system is also adopting "what3words," a global positioning system that organizes the world into 3-sq.-meter plots, to boost e-commerce among nomads who do not have fixed addresses. Mongolia's tourism industry is small, but ambitious expansion plans are underway. According to a 2015 World Travel and Tourism Council report, Mongolia's tourism sector directly contributes $254 million to gross domestic product, far below the world average of $19.4 billion. Mongolia saw only 415,000 international visitors last year, but national efforts to rework tourism regulations, attract investment and build essential support infrastructure are aimed at more than doubling international arrivals to 1 million by 2017. With Airbnb offering a direct marketing and sales tool to draw visitors, enterprising nomads like Oyunchimeg can also get a piece of the tourism pie. CHEAP BUT DEEP On the grassy steppe in Tov Province, Oyunchimeg stands outside her ger dressed in her best blue deel, or traditional Mongolian robe, to greet her guests. She presents each visitor with a blue scarf, a sign of respect. Everyone is ushered into the family ger and offered salty milk tea and traditional Mongolian snacks. They are welcome gifts for most guests, who have traveled over bumpy dirt tracks for more than an hour to reach the homestead. Her Airbnb guests seem surprised and delighted to have found a unique and deep cultural experience so easily and cheaply. "I didn't realize it was even an option," said American Anna May Imbrie, 24, one of Oyunchimeg's first Airbnb guests. "You couldn't get away with something like this in America," she added, noting how most Americans would shy away from inviting strangers for an immersive homestay. Imbrie and her friend Sophia Hegmann, both English teachers in South Korea, came to Mongolia on a weeklong holiday in July. They wanted a nomadic experience in the countryside during the annual Naadam Festival -- a national holiday celebrating traditional Mongolian sports -- and spent two nights in Oyunchimeg's extra ger, feeding baby goats, riding horses and watching local horse races. For guests, Airbnb homestays in the Mongolian grasslands embody a new, do-it-yourself kind of tourism that shuns package tours and puts a premium on "authentic" experiences. The herder families, on the other hand, seem willing -- even eager -- to show their lifestyle and traditions to the world. These homestays foster a kind of cultural exposure that many nomads otherwise would likely never get. Oyunchimeg says that her family and her tourists learn from each other, and that the cultural exchange and foreign language skills will benefit her youngest child, who is 4. She is also proud that Airbnb tourism is helping her family remain financially solvent as herders, allowing them to keep their free-spirited lifestyle so close to nature. "We're happy that we're helping to preserve this lifestyle," she said. October 20 -- Perhaps, you are in Mongolia or travel to Mongolia, this is your best "ONE CLICK" planning advice for your trip to Ulaanbaatar. With vast scenery, a hospitable nomadic culture, the spectacular Naadam festival and the legacy of Chinggis Khaan, rough-and-ready Mongolia remains one of the world's last great adventure destinations such Gobi Desert. Planning features and top itineraries to help you plan the perfect vacation. PLUS organised-tour advice, a guide to taking a events and activities in UB, info on the Trans-Mongolian Railway, and Wild Lands & Wildlife feature. Magical journey through the steppes of Mongolia! October 22 (Blur Style) Apart from the capital Ulan Bator and the location of geographic map, what we actually know about Mongolia? This landlocked country located in Asia is more than empty space and lonely steppe landscapes. Mongolia, according to the area, belongs to the group of the 20 largest countries in the world and is also the most sparsely populated country in the world. But its rugged beauty is unspeakable, and the eye of the German photographer Max Muench managed to grab the endless landscapes and the beautiful light is diffused through this interesting country.